The US port city of Seattle enacted laws on Monday raising minimum wage for workers to $ 15 an hour, the highest in America, thanks in large part to a movement led by Kshama Sawant. WASHINGTON: The US port city of Seattle enacted laws on Monday raising minimum wage for workers to $15 an hour, the highest in America, thanks in large part to a movement led by Kshama Sawant, a self-described socialist born in Pune, India.Sawant, 41, whose election to the Seattle City Council as a Socialist Alternative candidate last November was first reported in ToI, based her campaign largely on proposals such as raising hourly wages for workers to $15 and taxing the rich, slogans that are anathema in a country where terms such as socialism and socialist are treated with deep suspicion and disdain. But her campaign ignited support from the working class among the 400,000-strong electoral college in a liberal city that is better known for storied companies such as Microsoft and Boeing, located in nearby enclaves of Redmond and Everett. On Monday, the Seattle City Council passed legislation that will phase in the $15 an hour minimum wage over three to seven years, making it the city with the highest minimum wage in America. That will be almost double the $7.25-an-hour federal minimum wage that has remained stagnant for more than four years, and far higher than the $10.10-an-hour proposed by President Obama. It is also some 60 percent above Seattle’s current $9.32-an-hour wage that is tied to inflation. She then moved to Seattle, a city with such a left-liberal bent that local police was once reported handing out snacks at a large marijuana festival. 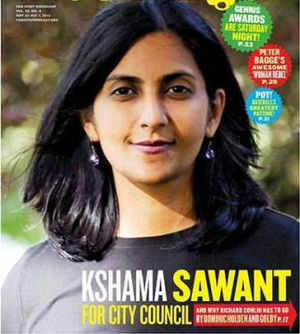 Elected to the City Council, she has been pressing for higher minimum wage, implementing rent control, protecting public sector unions from layoffs, instituting higher taxes on the wealthy to pay for public union jobs and services and other measures that find support among working class but raise the hackles of the capitalist interests. That was very much in evidence on Monday when a group called the International Franchise Association decried the City Council’s action as “unfair, discriminatory and a deliberate attempt to achieve a political agenda,” and announced that it will file suit to overturn the minimum wage plan. Many business have also said they will simply have to pass on the burden of higher minimum wages to customers.